1. E-tricycle or E-car, tire model? 2. Volt and wattage of motor, Speed, and torque/climb angle ? 3. Your vehicle weight and loading weight? 4. Lithium or lead-acid Battery? The voltage we could be 48v-96v, the max. speed can be customized to from 30-50km/h. As Power=Torque*RPM/9.549, the more RPM is, the less torque it will be. Tips: Please advise Voltage & RPM when placing order, If there is no marking, we will make it 48V 288RPM. We suggest to choose Balance/2nd model for mass production, as the repair rate of high speed model will be higher. The power of controller should ≥ power of motor. 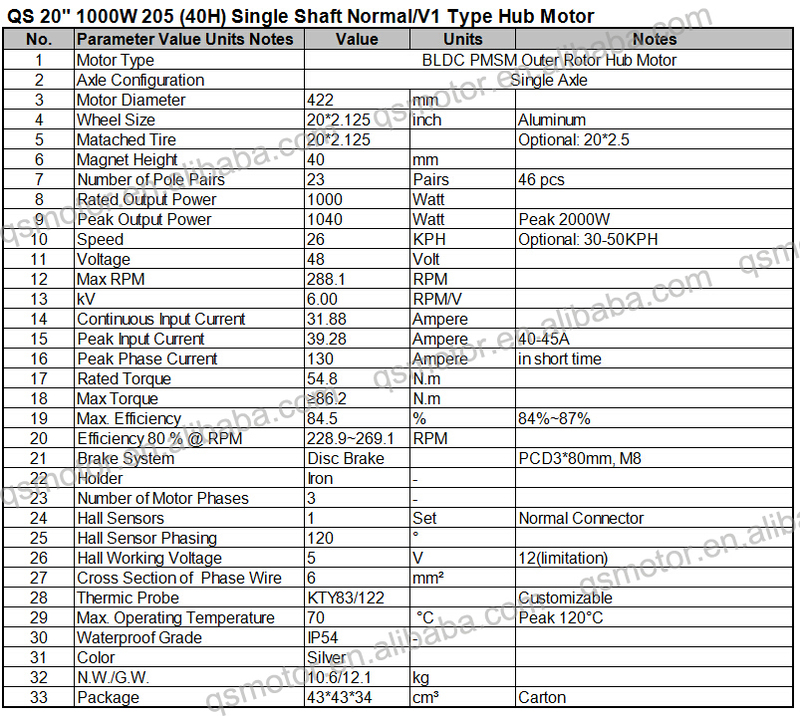 For 20inch 205 1000W motor(rated speed 30-50km/h), you could choose 40-45A(limited current) controller. When you using overvoltage, then the max. speed increased sharply, the real power is not 1000w. The higher speed get for motor(overvoltage condition), the bigger limited current should choose for matched controller, when considering the starting acceleration capability and climbing performance. If you don’t how to match controller, please don’t hesitate to contact with ue. We could also provide suitable controller. There are three types, Normal/V1 type (low cost), Export/V2 type (Cost-effective) and Extra/V3 type (Best Performance). 1. Comparison between V1 and V2. Holder: Iron(V1), Aluminum (V2) Hall: One hall with Normal connector(V1), Two halls with Waterproof connector(V2) Stator: V2 have a stronger configuration, more cooper, thicker section surface, energy saving in usage. Magnetic Steel Grade: V2 ≥ V1 Efficiency: 84~87%(V1) 86~88%(V2) In short, normal type is standard configuration, while export type is high configuration. The price differs because of the cost of raw materials. 2. Comparison between V2 and V3. The raw materials are alike, main difference in inner construction. For V3 (16 Pole Pairs): stronger configuration than V2, wider lamination, more cooper wire/phase wire and thicker Cross-sectional area section, bear more current in usage. Magentic Steel: V3 is wider and thicker. 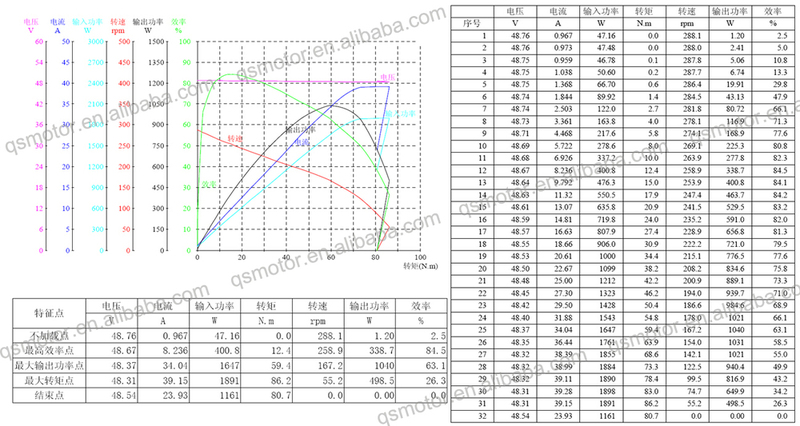 Efficiency: 86~88%(V2) 88~92%(V3) Thus, V3 have best performance. 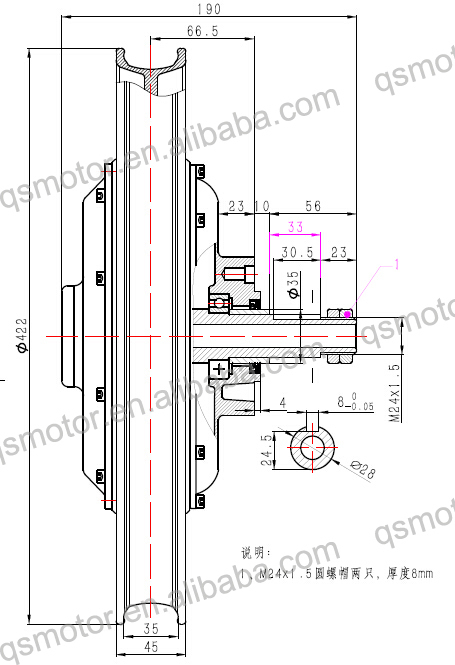 For 20inch motor, we have 20x2.125inch size, it can match with tire 20*2.125, 20*2.5. Anyhow, if you want to match with other tire model, pls. feel free to contact with us. 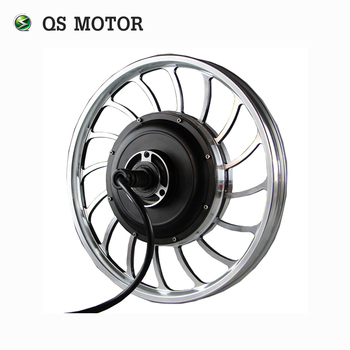 Quanshun Motor focus on motor for more than 10 years, which is specialized in research,development and production of electric motor. We are located in Taizhou, with convenient transportation access.All of our products comply with international quality standards and are greatly appreciated in a variety of different markets through the world. If you are interested in any of our products or would like to discuss a custom order,please feel free to contact us. We are looking forward to build successful business relationships with new clients around the world. Choose QS, Choose Quality & Service! We could provide suitable controllers, freewheel, brake disc, throttle etc. For the moment, we could not provide wheel set & Spokes.